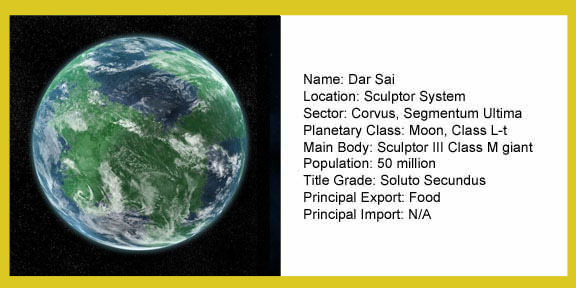 Dar Sai is a relatively undeveloped agricultural world, the second satellite of Sculptor III. Terraformed sometime during the Dark Age of Technology, the moon has been a backwater world in the system, lightly populated with a small agricultural economy. The moon has assumed greater importance for the Imperium in recent centuries. The expanded mining facilities on arid Hegira has increased demands for farm produce from Dar Sai, and as the biosphere on heavily industrialized Belzagor degrades and limits agricultural production, this world also has begun importing food for its burgeoning population. Fifty-eight percent of Dar Sai’s surface is covered with water. Three continents cover much of the temperate zone of the moon, creating conditions for verdant temperate forests broken up by mountain ranges and extensive marshes. Twenty percent of the land surface has been cleared for agricultural use. Huge plantations line the major rivers, while smaller, poorer farms are clustered on higher elevations. Approximately 50 million inhabitants live in the small towns, farms, and immense plantations that have been carved out of the thick forests. Most of the population are indentured servants working farms and plantations, with only 1 million living in urbanized areas to provide the minimal industrial services required to maintain agricultural machinery and the minimal local demand for luxuries. The moon is governed by a praetor, named by the Imperial governor of the Sculptor System, selected from among the most distinguished aristocratic families of Dar Sai. The current praetor, Justinian Hypatia, took office in 721.M41. The local culture is feudal, with the majority of citizens born on plantations and indentured to an aristocratic family, which under law is obligated to provide food, education, medical services, and other needs in return for labor. It is widely recognized, however, that some in the aristocracy are not as rigorous as others in living up to this legal obligation, thus a sizable percentage of the population is illiterate, impoverished, and largely ignorant of the universe beyond the confines of their plantation. A minority of the population are yeoman, farmers who own their land, and craftsmen who work in the cities. These citizens have earned some degree of independence from the aristocracy, although their legal rights are limited and strictly regulated by a series of legal agreements forged over the past 500 years. Other than a handful of riots and worker rebellions over the centuries, there has been no significant military actions on Dar Sai in recorded history. The planetary government did mobilize its militia when a Dark Eldar fleet conducted a two-day raid on Belzagor in 231.M38, but the xenos never approached Dar Sai. To the consternation of Imperial authorities, however, this peaceful existence was rudely shattered on 3 004 735.M41 when Praetor Hypatia received a report of xeno activity in the Hanui Valley and sent a reinforced platoon of PDF to the region. There, it discovered a regimental-sized force of Tau. After an afternoon of battle, the xenos were forced to retreat and disappeared into the heavy forests along the valley’s rim. Since then, mobilization efforts have been under way to expand the PDF and reinforcements have been requested from the Imperial sector headquarters at the Nguyen Naval Base, Belliose System. Military analysts are not surprised, however, by this turn of events. Dar Sai’s proximity to Medea III, a Tau stronghold, and its uneducated, resentful population makes the moon a logical “next step” for xeno expansion, some scholars say. The extensive forest canopy of the world also makes it difficult for orbital sensors to track xeno forces. Praetor Hypatia has warned the populace to avoid seditious speculation concerning the xeno threat and trust that the Imperial authorities will eliminate their presence. It also reminded citizens that it is a capital offense to speak to a xeno or fail to report any sightings to authorities. Praetor Hypatia is wise to stamp out speculation before it leads to rumors, fears, and civil disorder. His response to the Taus infiltration is far more aggressive than Gov. Thule. If he continues to serve the Imperium effectively, Hypatia may find himself promoted.